How much does it cost a trip to Tibet? If you want to book a Tibet tour but you aren’t sure what travel agency to choose we can suggest you a reliable agency. Click here to contact us and we’ll get back to you as soon as possible. p.s. For more in-depth information on traveling around China (insurances, vaccines, ATMs, internal flights, common scams, internet, food, etc.) you may have a look at my complete guide to travel to China. It’s massive, around 4,000 words, but you don’t need to read it all, just jump on the sections you find interesting to you. You can also download a travel phrasebook Chinese-English. The Holy Lakes of Tibet (Photo Essays). Your guide to visit the Everest Base Camp. p.p.p.s. I have no experience on traveling to Tibet from Nepal. If this is what you are planning to do I recommend you to check Dave’s website, The Longest Way Home. First of all, in order to reach Tibet you have to enter China, that is you need a Chinese Visa (unless you are already living in China). Getting a tourist Visa isn’t that difficult and I’ve already wrote a detailed guide on this topic. I recommend you to don’t mention Tibet while you are applying for the Visa. Even if you are going there only for tourism, the political situation is difficult (yes, this is an euphemism) and the Visa officers may start to questioning you real goals (are you an activist or, worse, a journalist?). Keep it simple and avoid to talk too much. Beside your Chinese Visa, you’ll need a TTB Permit (Tibet Tourism Bureau Permit or Tibet Entry Permit) to enter Tibet. From time to time China decides to close Tibet to foreign visitors, so you may want to check whether the border to Tibet is open or not before to book your flight. If the border is open the Tibet Entry Permit isn’t difficult to get. Actually the travel agency that will organize your trip will also take care of the permit. keep in mind that its cost should be included on the price of your tour. Notice that without the permit you can’t even get on a plane or a train to Tibet (you’ll need it at the boarding time). If you are thinking to hire a car and go there by yourself, I suggest you to re-evaluate your options. There are military check point everywhere in Tibet and around its borders: they will stop you, discover that you have no permit and kick out of China as soon as possible (at your own expense). So yeah, your only option is to book a private or group tour. I’ve been to Tibet with a random Chinese travel agency I found in Beijing (I don’t even recall the name). It was slightly cheaper than booking with a more foreigner-friendly agency (that is an agency that has at least a website in English language and someone that speak English at the office) and I must say I got what I paid. The overall organization was ok. However the hotels were terrible, the food was crap (we ended up eating several times at our expense to avoid the tour “official” restaurants) and the guide could barely speak English. Tibet is open to foreign visitors on the days you are planning to travel there. Be aware that there will always be the risk that the authorities decide to close the border without any notice but it’s not that probable. Make sure that the agency you chose is able to get the Tibet Entry Permit on your behalf. Read the review of previous customers on the agency’s website (all decent agencies will provide some reviews). In-depth reviews that provide the name and photo of the customers are better than anonymous short review such as “this trip was wonderful” are more difficult to fake. Just use a bit of common sense. Make sure that you are dealing with a serious agency. For instance, let’s say that you ask to the travel agent whether you can travel by yourself within Tibet after they provide the Permit for you or not. If the agent answers “Yes, of course” then run away. He’s lying to you as his only goal is to secure a new customer. As I’ve already wrote, you can’t travel alone within Tibet. The most you can do is to wonder around Lhasa by yourself (but don’t try to enter to any temple on your own). It’s difficult to answer to this question because it comes down to what you want. The best I can do is to highlight the different options that you’ll have. Generally speaking, you should plan a budget of at least 800 USD per person (the international flight is not included). Chinese Visa: the price depends on your nationality but it should be around 130 USD. Here you’ll find more details. Travel Insurance: a two weeks travel insurance with World Nomads costs about 70 USD (click on the link above to get a quote for more people if you aren’t traveling alone). I strongly suggest you to purchase a travel insurance as if you get sick in Tibet and you have no insurance you may end up spending more than what you can afford. It’s too risky. International flight: usually it’s not included on the travel agency’s fee. The prices may vary greatly according to the season and your departure city. Here you’ll find some tips on how to get the best deal. Internal flight or train: You’ll most luckily land in Beijing or Shanghai. From there you can choose to take a plane or a train to Lhasa, the capital of Tibet. The internal trip is usually included on the agency’s fee (make sure to double check it!). Most of agencies will offer you both options (plane or train). I will discuss the pros and cons of traveling by train in the next section, however keep in mind that traveling by train will be cheaper (you can expect a difference of at least 200 USD). Private or group tour: If you travel alone or with a friend (or partner) a group tour will be a bit cheaper. However if you are at least three people the price should be pretty much the same. The duration of the trip: I suggest at least ten days if you are planning to reach the Everest Base Camp or eight days if you just want to visit Lhasa, the Holy Lakes, Shigatse and a couple of Buddhist temples on the road. There is no point to go to Tibet and stay in Lhasa! The hotels: Most of agencies will offer you the possibility to choose the type of hotel you want to sleep in (from 2 to 5 stars). The price will vary according to your choice. International flight: 800-1000 USD from U.S. and 600-800 USD from Europe if you want to come on summer and buy the ticket at least two months before your departure. All inclusive organized trip with a travel agency: 600-800 USD (assuming that you are choosing the cheapest option). So yeah, you can’t expect to visit Tibet for less than 1,500 USD per person (unless you already live in Asia). Notice that I didn’t include any souvenirs, food or other extras (for instance a cowboy hat or a yak burger!). Altitude sickness: Even if Lhasa has an altitude of “only” 3,490 meters (11,450 ft) it doesn’t make sense to travel to Tibet and only visit the capital. You’ll want to visit at least the Holy Lakes and, maybe, the Everest Base Camp. This means that you’ll travel up to 5,300 meters. And, unless you are a Nepalese sherpa, you’ll get altitude sickness. Don’t freak out, you’ll survive. The symptoms of altitude sickness are very similar to a bad hangover. However if you reach the Tibetan plateau gradually, that is by train, your body will have the time to adapt itself and you’ll be able to enjoy your trip much more (I’ve seen people getting really sick and even puking on the bus). Landscapes: The Qinghai-Tibet Railway is an amazing ride, especially while you are crossing Qinghai Province, a land of deserts and astonishing lakes (see the above video for more details). Also, you’ll be able to claim that you traveled along the highest railway in the world! Experience: Spend two night in a Chinese train is quite an experience. I’ve wrote a full guide on traveling by train in China so just click on link if you want to learn more about it. Price: The train is cheaper than the plane (at least 200 USD for a return trip). Time consuming: As I said, it takes about 45 hours for traveling by train from Beijing or Shanghai to Lhasa. What we did was to go by train (so that we enjoyed the landscapes and minimized the altitude sickness symptoms) and come back by plain (so we gained two days). No shower for two days. Myself riding a yak at 5,300 meters of altitude. What do you expect from Lhasa, the capital of Tibet?. 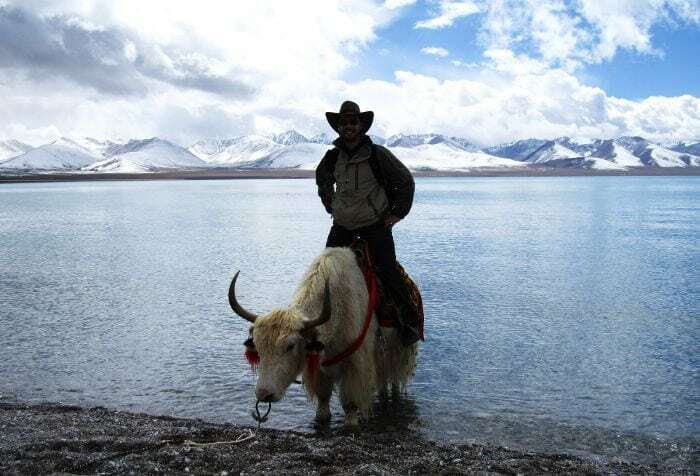 You don’t need any special equipment to travel around Tibet (unless you want to climb the Everest but in this case you are either crazy or already know what to bring!). Of course bring a winter jacket as it may be cold, especially at night, and sunglasses as the sun can be quite strong up to 5,000 meters. If you have never been to China and are wondering whether you should bring anything special or not, you can read the complete list of what I carry with me when I travel around the Middle Kingdom. Avoid to take pics of the police or the military check points: you’ll risk to get your photo camera or smart phone seized. No kidding. Expect to see the worst bathrooms of your life, especially where you’re far from the main cities (Lhasa and Shigatse). Local people will often ask you some money to take photos of them or their animals. Usually you can get around with 10 RMB (less the 2 USD). You can also take photos with yaks (yes, I paid to take the photo on the yak that you can see on this article), huge Tibetan dogs and so on. In this case it may be more expensive (20 or 30 RMB). The best way to reduce the altitude sickness is to drink a lot of water as the main cause is the de-hidratation of the brain (as for a bad hangover). Don’t believe medias, Tibet isn’t dangerous! The overall trip may be tiresome as you’ll spend a good chunk of your trip in a bus, moving within lakes, temples and glaciers. However I do think it’s well worth and I’m looking forward to go back to Tibet soon! Is Tibet a part of China? Currently, Tibet is a Chinese Autonomous Region. This is why you need to get a Chinese visa before being able to enter Tibet. 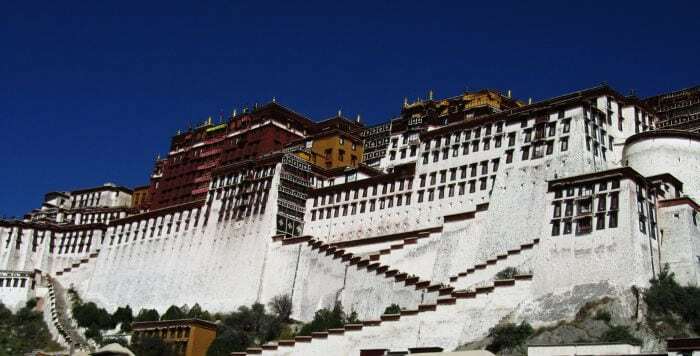 In addition, Tibet is subject to a special regulation, and if you don’t have a Chinese passport, you will have to get an entry permit, which can only be obtained through an authorized travel agency that takes care of your trip. What are the differences between Tibet, Nepal and Bhutan? The Autonomous Region of Tibet shares borders with Nepal, India and Bhutan, but despite the fact that Tibet’s population has a certain cultural influence in Nepal and Bhutan, their populations are quite different. While Nepal is culturally similar to India and its religion is Hinduism in its majority, Bhutan is culturally closer to Tibet. Bhutan is mainly Buddhist, but it’s religion is not based on Tibetan Buddhism. Neither Bhutan nor Tibet can be visited freely, so you will have to hire an organized tour. On the contrary, Nepal allows free entry without the need to hire any agency. How can I cross the border between Tibet and Nepal? It is possible to go to Nepal from Tibet. In fact, many tours of Tibet end in Kathmandu, Nepal’s capital. If you want to visit Nepal as well as Tibet, it’s recommendable to first travel to China and then later to Nepal, as entering China through Tibet can be difficult. Where is the border between Tibet and Bhutan? To the extent of our knowledge, border posts between Tibet and Bhutan don’t exist. If you want to travel to Bhutan from Tibet, you will first have to go to Kathmandu and later to Bhutan. Is there any alternative to Tibet? Tibetan ethnic minority populations can be found in other parts of China, such as the provinces of Sichuan, Yunnan and Qinghai. So, if you want to get to know Tibetan culture without the need to request a Tibet Entry Permit, you can visit these provinces. However, in the a province of Sichuan, it’s also possible that you will have to request some type of permit through an authorized agency to be able to visit the Tibetan populations. Yes, Tibet is safe, even for solo travelers. Tibetans tend to be very welcoming. The main dangers are related to natural disasters, accidents, and at times encounters with animals such as wild dogs. Also, you have to take care to not get caught in the crossfire in the event of unrest. Do they speak English in Tibet? Despite being an international language that is more widespread every day, the majority of Tibetans do not know how to speak English. English is only spoken at hotels for foreigners or luxury hotels in large cities such as Lhasa and Shigaste. The natives speak Tibetan, and almost all people under 35 can also communicate in Mandarin. Is arranging travel to the TAR difficult? No, the travel agency that you choose will take care of practically everything when it comes to organizing your tour. All you have to decide is the route that you want to follow and to exchange a few emails with them. Remember to choose a trustworthy agency with a good reputation, and they will take care of the paperwork for the necessary permits. 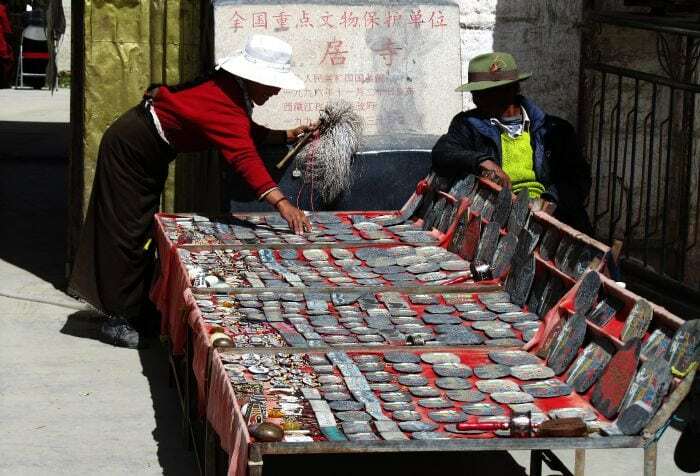 What should I buy in Tibet? The work of Tibetan artisans is very beautiful. Tibetan carpets are renowned for their environmentally-respectful technique and their detailed designs. Jewelry, amulets and rosaries are another option, as well as musical instruments, cups and tea leaves. Make sure you are willing to bargain. Yes. The main reason why travel agencies offer “tour packages” is because the majority of travelers aren’t very familiar with Tibet. However, almost all specialized travel agencies will let you create your own itinerary. Keep in mind that not all of the areas of the Autonomous Region of Tibet are always open. I think now you know pretty much everything you need to plan your trip. People tend to think that traveling to Tibet is complicated. The reality is that China has amazing infrastructures and the travel agency will take care of all the technical details such as the Entry Permit or the internal trips. So you won’t need to work too hard on the organization.